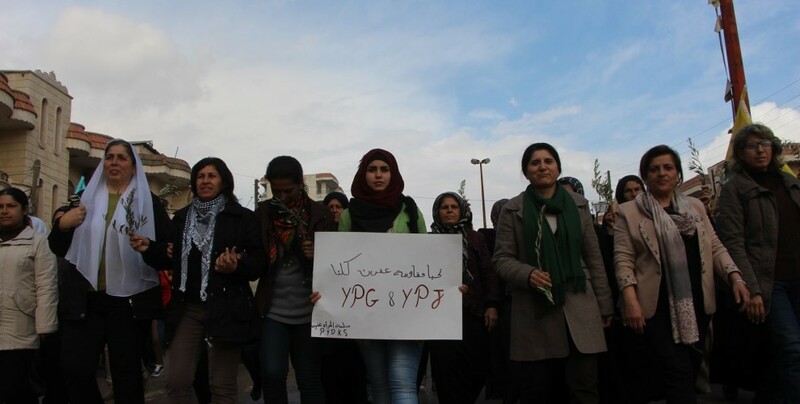 The women organizations in Afrin called upon all human rights organizations, institutions and the United States to break their silence and act to stop the bloodshed and the loss of innocent lives in the canton. The women organizations in Afrin Canton of Northern Syria published an appeal addressing to the international community. “The lands are being violated, children are being killed, and women are assaulted, and the world is still silent about the massacres committed. Afrin province is still being attacked by the Turkish army and its supporters from Al-Nusra and Al-Qaeda, where the Turkish planes and helicopters began shelling the villages, towns and areas. Not only that, they also began to shell the city center in order to intimidate and displace the citizens, which led to massacres against children, women, the elderly and defenseless civilians, including immigrants who had fled from their villages to the city to escape from the brutality of the Turkish army. The aim of the Turkish aggression is to displace the indigenous people of Afrin province through implementing the scorched-earth policy. This is what Erdogan said when he announced that he would continue shelling Afrin until he creates a safe area, according to his claims, to return three million Syrian refugees who have been in Turkey since the beginning of the crisis in Syria, and this is the biggest evidence that he is fighting to change the demography of the region as he has done in Jarablus and Al-Bab regions. Erdogan is trying in various ways to occupy Afrin by striking the infrastructure of the Kurdish people and spreading terror in the people’s hearts by shelling houses and buildings. As a result, the children are the first victim of this war, causing them psychological and neurological situations that can't be easily processed, as it isn't easy for children to see their parents killed in front of their eyes. In addition, they deprive children and young people of the right to education by targeting many schools, which in itself is a humanitarian disaster. The Turkish state has exceeded all international and humanitarian laws and conventions in its aggression on Afrin. Chlorine gas has been used in the border villages, this was confirmed the doctor reports through the symptoms that appeared on patients such as suffocation, redness of the skin and other symptoms. They also mutilated the bodies with the most inhumane methods. Even the stones didn't get rid of their evil, as attacks targeted the historical and archaeological sites in Afrin in order to erase the history of civilizations living on that land and also erase the traces of humanity from existence. We are surprised by the international silence, the humanitarian organizations and the children and women rights organizations towards these massacres and inhumane violations committed in Afrin. We, women of Afrin, are determined to defend on our history, our heritage and the land that we inherited from our ancestors. So we pledge that we will resist and fight until the moment hint to eliminate injustice and tyranny and stop the Turkish occupation.